Researchers say strictly land-line phone polling is missing a younger, wireless demographic. What if they took a poll and forgot to account for 20 percent of the people? What if white people aren&apos;t telling the truth about their likelihood to vote for a black man? What if traditionally liberal women decide that gender is more important than issue-related differences? These are the questions that keep pollsters up at night. A growing trend — dependence on cell phones — has had them jittery for a while. A Nielsen survey completed in September showed that 17 percent — 20 million — of U.S. households had gone wireless, and it could be 20 percent by the end of the year. The demographic of the cell-phone-only crowd is largely young, ethnic and lower income. Indeed, a paper released at the beginning of the year by Macro International, a research, management and marketing firm based in Washington, D.C., noted that "certain populations, such as 18- to 34-year-old adults, have all but disappeared in land-line surveys." Depending on which survey you look at, this demographic favors Barack Obama by 26 to 34 points. 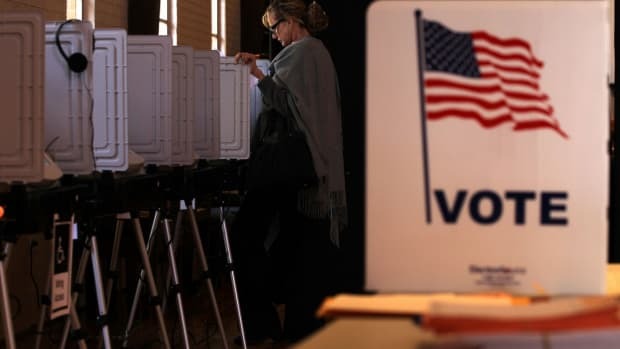 That many polls haven&apos;t included cell-onlys, combined with a growth in the population that has snipped the land-line connection, has made this presidential race what some pollsters delicately term a "transitional" election. And this transitional period comes as one of the most watched, demographically nuanced and fiercely competed elections plays itself out. That recent presidential polls are skewed because they don&apos;t account for younger, cell-phone-only voters is not universally accepted. One pollster asked about this by the Richmond Times-Dispatch responded with a barnyard epithet: "Horseshit!" Most of the polls released today have been "weighted" to compensate for age and other demographic differences to include the cell-only crowd. The process has depended on an assumption that people reached over land lines are similar politically to their cell-only counterparts. In other words, responses from an 18-year-old Hispanic male reached by a land line are extrapolated to be the same for the cell-only 18-year-old Hispanic male. Should that assumption be made? Based on its research, the Pew Research Center says no. Over the course of three surveys since June, Pew researchers found that there is a two- to three-point differentiation between traditional land-line users and cell-only users with the same demographic profile, with the advantage to Obama. Scott Keeter, lead researcher of the Pew study, noted that ordinarily the finding would not be considered "statistically significant." But then, this is not an ordinary election, and the last presidential contest was decided by little more than 1 percent of the vote. "It looks like this is going to be a very close election," Keeter said. "A two- or three-point bias could be the difference between getting it right or getting it wrong." The only entity that has gathered consistent cell-user data over a period of years is the U.S. Centers for Disease Control and Prevention&apos;s National Center for Health Statistics, which has been tracking cell-only households since 2004 through its National Health Interview Survey. A chart in an NCHS paper released in May shows growth in cell-only households at about 1 percent a year from 2004 to 2005, increasing each year — to about 2 percentage points growth between December 2006 and December 2007. The trend is linear, according to Paul Lavrakas, a prominent statistical researcher and consultant for both The Associated Press and ABC polls. He points out that the NCHS data, which showed cell-only households at 14.5 percent in July 2007 and nearly 16 percent by the end of 2007, is nearly a year old. The NCHS survey also tracks households that receive almost all of their calls on wireless telephones despite having a land-line telephone (used primarily for another purpose, such as an Internet connection or fax access). NIHS data from July to December 2007 showed that more than 13 percent were in this group, swelling the percentage of Americans largely reachable only by cell phone to nearly 29 percent by the end of 2007. Recent economic woes could speed up the wireless trend. The Nielsen report found that cell users who clip their land line save an average of $33 per month in a household of one subscriber, less $6.69 for each additional wireless resident. The Pew surveys found the cell-onlys were less likely to lean to the Republican Party and even less likely to say they support Sen. John McCain. Among land-line respondents under age 30, there is an 18-point gap in party identification; 54 percent identify or lean Democratic while 36 percent lean Republican. Among the cell-only respondents under age 30, there is a 34-point gap, with 62 percent leaning Democratic and 28 percent leaning Republican. A traditional knock on young voters is that they may register, but they often fail to turn out on Election Day. But Pew researchers have found that "cell-only young people are registered to vote, have given a lot of thought to the election and say they definitely will vote — factors that are also closely associated with turnout." Why haven&apos;t pollsters been regularly surveying the cell-phone-only crowd? In a word, cost. Because of the Telephone Consumer Restriction Act, random digital dialing cannot be used to reach cell phones; they must be manually dialed. That and other problems with calling cell phones typically increase the cost three to four times, according to Lavrakas, and often more. Researchers note that some polls have included cell-onlys — Gallup announced late last month it would use them in general population studies — but many have not. The Pew findings appear to be having an impact, however, and several of the people interviewed for this article said it is likely more polling organizations will include cell phone samples this fall. Pew researchers will include cell-only calling in all five polls they plan to conduct before Election Day, and Macro International will include it in most of its surveys, depending on the demographic they seek. "It&apos;s come to the point where it doesn&apos;t seem appropriate to be ignoring 20 percent of our population," said Randal ZuWallack of Macro International, who collaborated with health department researchers in six states to complete the first cell phone omnibus survey in 2007. To further complicate matters, wireless voters will likely fall off the radar when pollsters look to individual states. A cell-only sampling is not practical for statewide polls because of the trend of highly mobile cell-phone users to keep their phone number when they move across state lines or buy a service in one state and live in another. When it comes to polling to determine the outcome of the electoral vote, pollsters generally have no choice but to weight state data to account for cell-onlys. Alison LeBreton, vice president of client services for Nielsen Mobile and an author of the report cited earlier, has a tip for those following the polls: The percentages of cell-only households are highest in the Midwest and Southeast, moderate in the West and lowest in the Northeast — for what it&apos;s worth in this "transitional" election. The importance of including cell-only households in phone surveys continues to grow alongside the difficulty of getting accurate results if you don't. Technology, such as the humble cell phone, may knock down some of the impediments that tarnish the name of foreign aid. Did Trump Win Thanks to Voters Who Stumbled Across Fox News? New research finds Republican presidential candidates benefit when cable systems put Fox low on the channel line-up. New research suggests that the iPhone's success is largely due to its ability to offer what other smart phones did not: Browsing was the killer app.